If memory serves me well, my mum first taught me how to make these dumplings (we call them wan-tons) when I was around 11 or 12. Back then, we were a big family – grandma, mum, dad, my three brothers, me and our amah (most people think of amahs as live-in nannies but in real life, they’re much more than that – they’re part of the family and we called our amah, Jie Jie, as in older sister). Dumpling days were really special occasions in our house because mum only made them two or three times a year. I suspect it wasn’t because they were difficult to make but because of the sheer number of dumplings we’d have to wrap. My dad and brothers alone could easily devour between 30 and 40 dumplings each at every sitting. In addition to our family, we’d often have friends over during dumpling days too. 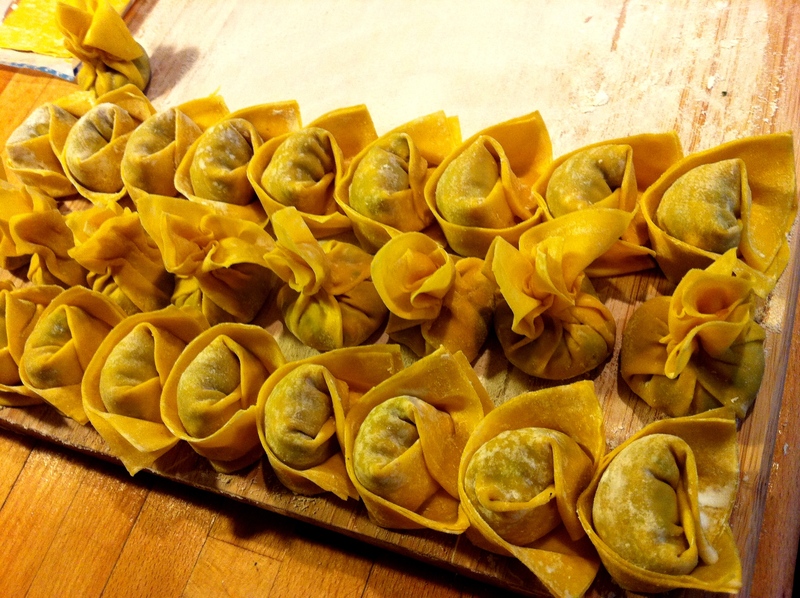 I don’t know how many dumplings we actually wrapped but it couldn’t have been less than 500 every time! Back then, I’m sure I probably found the task of wrapping dumplings tedious but my memories now are purely happy ones; of me, mum, grandma and Jie Jie sitting around the table with a great big vat of whatever stuffing mum had chosen to mix. Beside the occasional bits of chatter, all you’d really hear would be the clicks of our chopsticks scoping out little mounds of stuffing before we’d put the chopsticks down to wrap each dumpling by hand. Every now and then, one of us would get up to either fetch more wanton skins or refill the small saucers of water we had in front of us, used to moisten and bind the dumpling together once they’d been wrapped. This would take up the better part of an afternoon and once completed, that’s when the gorging would start! Mum always tried to put the newly wrapped dumplings aside as she said it would help them set better but in truth, that rarely happened because everyone would start pestering her (me included!) to cook them immediately. Even if we stuffed ourselves to the gills, you’d always try and leave a teeny bit of room to drink some broth, which was nothing more than the water in which these hundreds of dumplings had been cooked. On very rare occasions, we’d even have a few dumplings left over the next morning. Happy days! Like my mum, I (sadly) only ever make dumplings once or twice a year now but that’s because I tend to make dumplings in batches of 50-60 (I don’t really like freezing wanton skins once I’ve opened the packet) and that’s simply too many dumplings for me and my husband to get through in one go. These dumplings were the first dish I made for his family when I offered to make them a traditional Chinese meal and molding each dumpling into my family’s distinctive shape is a never-ending source of pride and joy to me these days. Every Chinese family has its own unique way of wrapping dumplings. My mum is Shanghainese and I’ve called these the waung dumplings after her family. The distinctive shape of the waung dumpling is meant to resemble the traditional Chinese gold ingot. 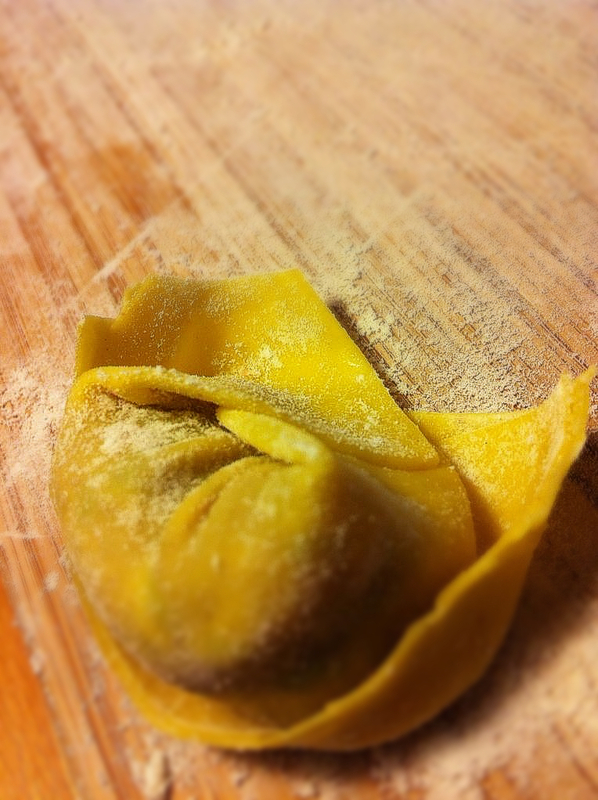 If you find it too difficult to wrap dumplings this way, just revert to the infallible ‘ball and scrunch’ method. After all, it’s how the dumpling tastes that’s the most important thing! What I love about dumplings is that there is no one ultimate stuffing mixture. It’s really up to you what you want to make. You could mince chicken, broccoli and scallops to form stuffing mixture, or mix pork, chilli, mushroom and salted radish to create another. If you’re vegetarian, you might want to try experimenting with everything from chestnut and mushroom to potato and tofu. If you come up with your own favourite mix, I’d love to hear about it! Learning to wrap a dumpling isn’t difficult but it does require practice! Everyone’s first few attempts are horrendous (trust me!) but it’s often because beginners make the same mistakes. There really is only one golden rule – don’t overstuff your dumpling! Whatever shape your dumpling takes, the trick is to ensure none of the stuffing escapes because you want your pastry to seal properly (especially if you’re planning to deep fry them). If your wrapped dumpling has stuffing escaping from pockets, tears or leaks, it’ll almost certainly disintegrate or fall apart when you start cooking it. Great for the broth, terrible for the dumpling! 3 packets of wanton ‘skins’ (You normally get 3o wanton sheets in a packet and almost all Asian/Chinese shops will stock these. They cost approximately £2.00 per pack. They also come in slightly different shapes and sizes so do experiment with your wrapping style! I would recommend you try and find wanton skins for frying because they work just as well boiled but have a thinner and therefore smoother texture. 300 grams lean pork mine (Feel free to replace the pork with your choice of meat though I wouldn’t personally recommend using beef or lamb because these flavours are quite strong and, traditionally, Chinese dumplings are meant to be light and delicate. However, if you prefer stronger flavours then swap it for whatever meat you’re in the mood for. Don’t be afraid to slightly over-season your stuffing mixture with salt and white paper because the cooking process, whether frying or boiling, will tone down your seasoning automatically. In one bowl, mix the pork mince, 1/3 of the minced prawns, leafy greens, half the mushrooms, ginger, 3 tbsp soy sauce, 1 tbsp oyster sauce, 1 tbsp xiaoxing, 1 tsp maggi seasoning and half of the spring onions. Ensure the pork and ingredients are mixed together well (using your hands to mash everything together gets the best result). In another bowl, mix the chicken, teriyaki sauce and all remaining ingredients together. 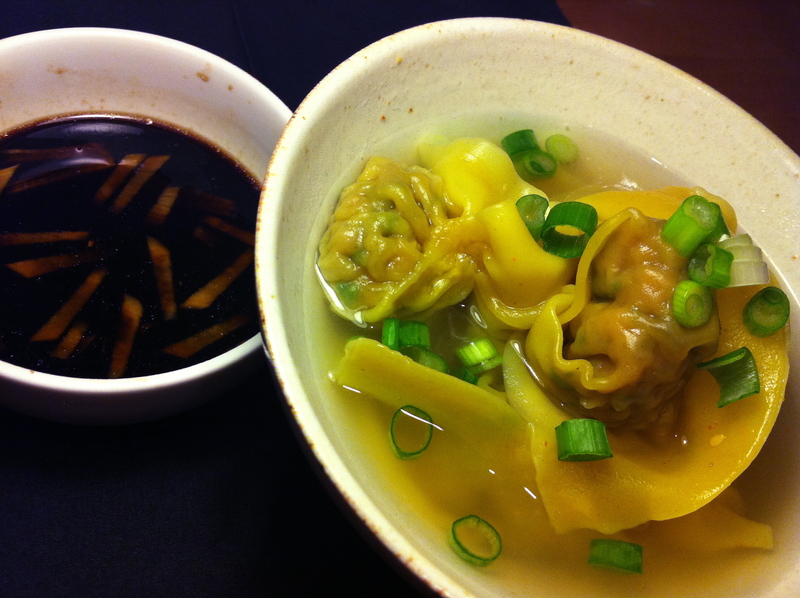 Leave both bowls to marinate for a minimum of 30 mins before you begin to wrap the dumplings. 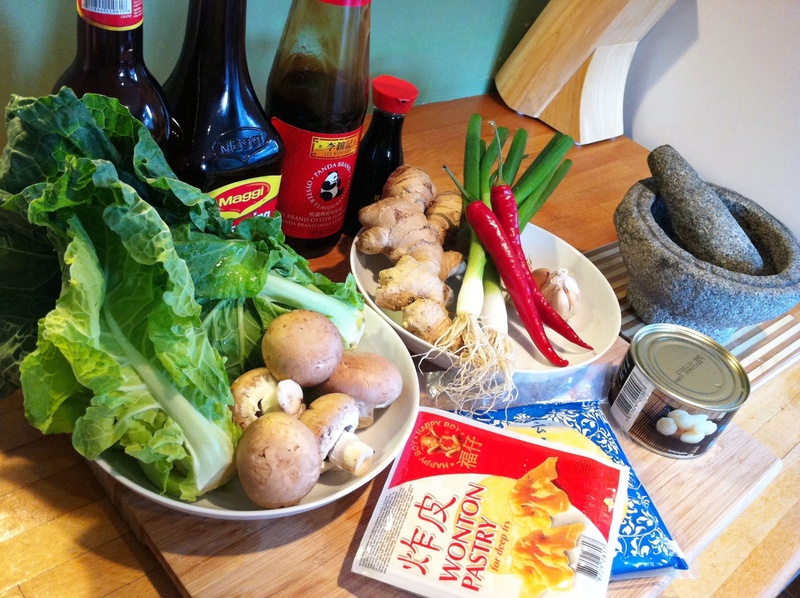 In addition to plain old soy sauce or sweet chilli sauce, try making this vinegar and ginger dipping sauce. Finely slice some fresh ginger and put in a bowl with 2 tbsp of Chinese black vinegar. Let the ginger seep for ideally 5-10 minutes before serving. You can also serve the dumplings with just a saucer of normal or sweet soy sauce. A sweet chilli dipping sauce works brilliantly if you’re deep frying the dumplings. Ponzu sauce works well too (mix 2 tbsp of soy sauce with 1 tbsp of rice vinegar – works a treat!). If you’re catering for a dinner party, cook some plain egg noodles. Portion out the egg noodles, cover in the broth and serve with 5-6 dumplings per person. Without noodles, most people I know can easily eat between 10 and 20 dumplings each! Lay a single piece of square wanton skin flat on a plate/board. Place ½-1 tsp of stuffing mixture into the middle of the wanton skin. Dab your finger with water and wet the top edges of the wanton skin from left edge to right (the two edges furthest from you). Take the 2 bottom edges of the wanton skin (nearest to you) and fold over the stuffing to meet the other two outer edges (press the skin down on the top line so the water binds the fold). 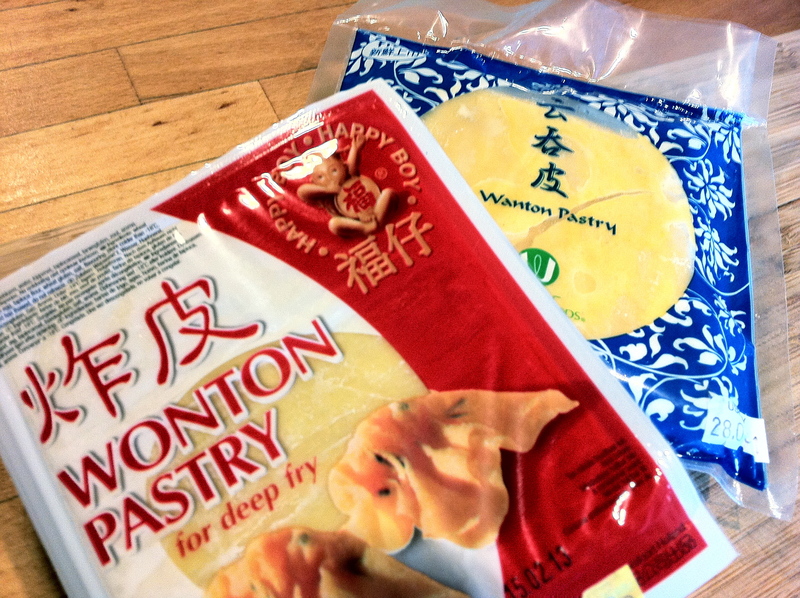 Lift the sealed fold and turn the flap back towards you (the innermost edges of the wanton skin should meet in the middle and you’ll notice the stuffing mixture will have been squeezed into a ball shape in the middle). Dab a finger with water and seal the two innermost edges. Lay a single piece of square wanton skin flat on a plate/board. Place ½ tsp of stuffing mixture into the middle of the wanton skin. Pull all four corners of the wanton skin to the middle and using water, scrunch up the skin around the stuffing, creating a round ball of stuffing. This way of wrapping dumplings always reminds me of Christmas – because it’s the only way I know how to wrap odd-shaped or round presents! There are a number of ways to cook the dumplings and each method will alter the taste so the same batch of dumplings can be made to taste very different. Offer different dipping sauces to vary the tastes even more. Frying: Cover a pan with 2-3 cm of vegetable oil and gently drop the dumplings (one by one) into the oil. 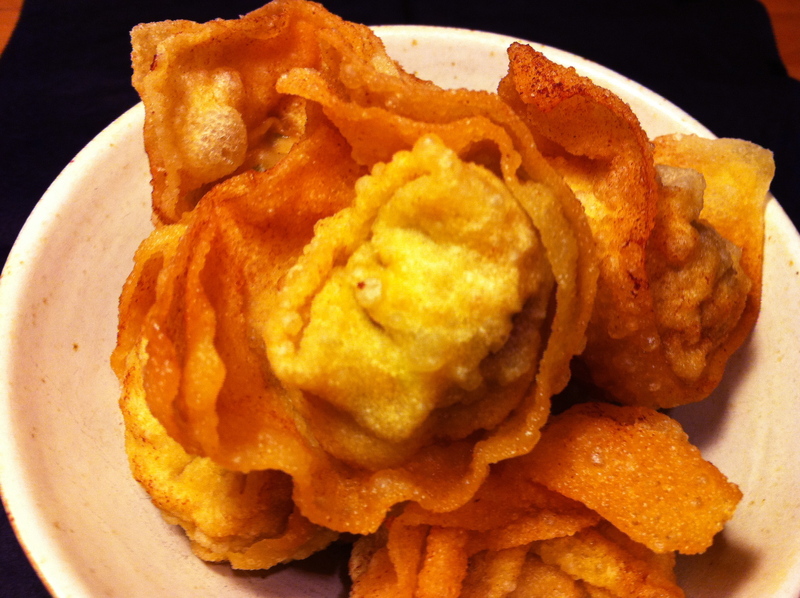 Fry them for 2-3 minutes (until the wanton turns a golden brown). Drain on paper towels to remove the excess oil and serve piping hot! Why don’t you upload a short clip showing how you wrap the dumplings next time you make them. I know how to do it since I did a lot of the wrapping meself but going through your description I can imagine it can be challenging.